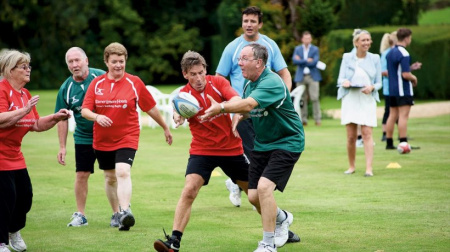 The arrival of walking rugby at Seaford Rugby Football Club has been both welcomed by retired players and adored by new players who have never even held a rugby ball. The game is made up of four quarters each lasting 5 minutes with a 1 minute break to allow hydration and a quick team talk. The game is played at a furious walking pace and the basic game is very similar to full contact rugby but is played without full tackle and just touch, obviously we are all that bit older and slightly more fragile but we walk and pass the ball, loop round and create space. There is strictly no kicking and the offside rule applies after a tackle to allow for a pass to be made, the defending team must retreat 2 metres towards their own goal line. The pitch should be wider rather than longer and played with size 4 balls. The team should be more than 3 players but less than 8 players. There is no official score keeping but we know who scored and who is in front. The game is enjoyed first and foremost without the emphasis on personal performance. We meet every Sunday morning at Seaford RFC, The Salts Recreation Ground, Seaford, BN25 1DR at 10:00 and after the game have a sit down and a bowl of soup or a bacon sandwich with juice or a coffee.